CAPP, the Center for Axion and Precision Physics Research, was established at the KAIST campus in Daejeon, by the Institute for Basic Science (IBS) of South Korea in October 2013. Since then, CAPP is building up a strong experimental particle physics group at KAIST specializing in axion dark matter and proton electric dipole moment searches. The Korea Undergraduate/graduate/H.S. Science Program (KUSP) is a research oriented summer program of CAPP. 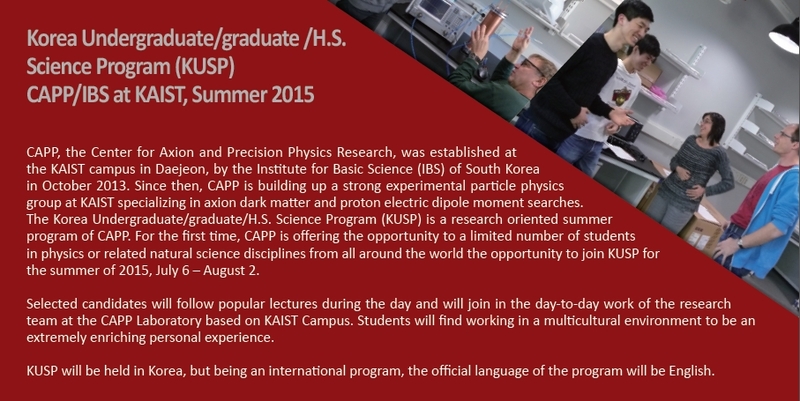 For the first time, CAPP is offering the opportunity to a limited number of students in physics or related natural science disciplines from all around the world the opportunity to join KUSP for the summer of 2015, July 6 – August 2. Selected candidates will follow popular lectures during the day and will join in the day-to-day work of the research team at the CAPP Laboratory based on KAIST Campus. Students will find working in a multicultural environment to be an extremely enriching personal experience. KUSP will be held in Korea, but being an international program, the official language of the program will be English. CAPP/IBS will cover almost all of the participation costs at KUSP. Please refer to the website for more detail information. We are happy to answer any of your questions about KUSP 2015. Please contact us!